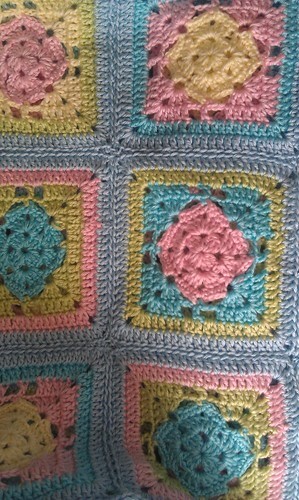 I'm not one who does Granny Squares or connecting them for blankets. It always seemed so tedious to me so I avoided making them. Continually seeing Granny Square crochet blankets and even clothing in such intricate designs kept me thinking about them every time I began a new project. I finally have gotten over my fear of the Granny Square connecting and made a blanket! Welcome to Spring Fling Crochet Blanket! 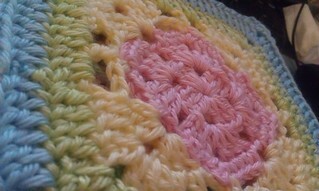 Easy granny squares in gorgeous Spring colors to get you in the mood for warmer weather! I used four different pastel colors that I varied per block (only 3 colors were used per block) and coupled them with a soft, light blue for the borders around them and around the blanket. There is no specific combination of colors that I did, I just made sure to vary them throughout. With their initial blue border, the squares measure 7". I made 5 rows of 3 squares each. But you can make yours bigger! Rnd 1- ch 4, 2 dc in 4th ch from hook, *ch 2, 3 dc in same ring, repeat from * 2 times more. Rnd 2- sl st to corner space, (ch 3, 2dc, ch 2, 3 dc) in same space, ch 1, *3 dc, ch 2, 3dc in next ch2sp, ch 1, repeat from * around. Rnd 3- ch 1, sc in same st, sc in next 2 dc, (sc, ch 2, sc) in corner space, sc in next 3 dc, ch 4, *sc in next 3 dc, (sc, ch2, sc) in corner space, sc in next 3 dc, ch 4, repeat from * around. Finish off. Rnd 4- Join new color with sl st to any ch4sp. (Ch 3, 2 dc, ch 2, 3dc) in same space, *ch 2, sc in corner space, ch 2, (3 dc, ch 2, 3 dc) in ch4sp, ch 2, repeat from * around. Sl st in original start space. Rnd 5- ch 3, dc in same space, dc in next 2 dc, *(2 dc, ch 2, 2 dc) in corner space, dc in next 3 dc, ch 2, dc in next sc, ch 2, dc in next 3 dc, repeat from * around. Sl st in top of beginning ch 3. Rnd 6- Join new color onto previous color with sl st. ch 3, dc in same space, dc in next 3 dc, *(2 dc, ch 2, 2 dc) in corner space, dc in next 5 dc, 2 dc in ch2sp, dc in next dc, 2 dc in ch2sp, dc in next 5 dc, repeat from * around. Rnd 7- Join new color onto previous color with sl st. ch 3, dc in same space, dc in next 5 dc, *(2 dc, ch 2, 2 dc) in next corner space, dc in next 5 dc, *(2 dc, ch 2, 2 dc) in corner space, dc in next 19 dc, repeat from * around, sl st in top of ch 3 start. Finish off. Note: Be sure finished sides are 23 dc stitches each. Using your favorite joining method, connect your squares! Not sure what my method is called but I wove yarn using my yarn needle back and forth through the loops farthest from each other on the squares. Then I made a single row of dc all the way around for the final border. 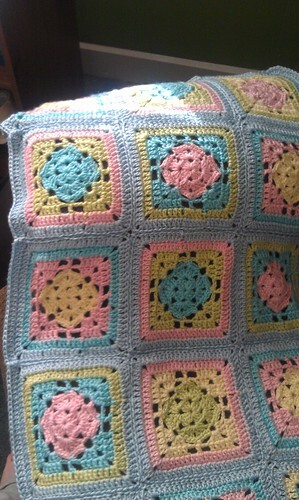 I love to crochet granny square blankets. Yours is really pretty and soft looking. I like the colors you used and I especially like how you used such a pretty blue for the border. Hope you make some more! You truly are inspiring me. Thank you so much for this beautiful soft pastel blanket. My grand daughter loves rainbows and it would be so cliche to literally make a rainbow blanket. This is a soft gentle colour way like looking at the sun breaking through a rain shower. Perfect. Lucky me just stumbled upon your blanket. Many thanks for sharing the beautiful pattern with us. I am most anxious to begin this project as I just found out 2 days ago that our next door neighbor will be having their first child. As it turns out I completed a knitted cowl while at the doctor's this morning. 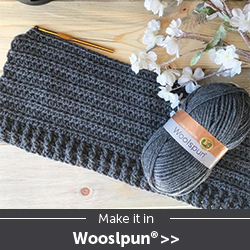 I found my next project thanks to you! I will go through my vast stash shortly and begin the blanket this evening. Thank you again for the pattern. It is both kind and generous of you. A New Year And A New Pattern! ALL RIGHTS RESERVED. UNAUTHORIZED USE AND/OR DUPLICATION OF THIS MATERIAL WITHOUT EXPRESS AND WRITTEN PERMISSION FROM THIS BLOG’S OWNER IS STRICTLY PROHIBITED. EXCERPTS AND LINKS MAY BE USED, PROVIDED THAT FULL AND CLEAR CREDIT IS GIVEN TO SHELLY AND MISSED STITCHES CROCHET WITH APPROPRIATE AND SPECIFIC DIRECTION TO THE ORIGINAL CONTENT. DO NOT TAKE MY PHOTOS AND USE THEM TO SELL ITEMS YOU MAKE FROM MY CROCHET PATTERNS AND TUTORIALS.YOU ARE FREE TO SELL WHAT YOU MAKE FROM MY PATTERNS. 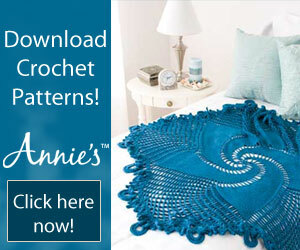 Subscribe to the newsletter to be the first to know of NEW patterns and projects! NOTE: THIS SITE IS SUPPORTED BY ADS- PLEASE ALLOW THEM TO DISPLAY TO KEEP THIS SITE FREE!!! !